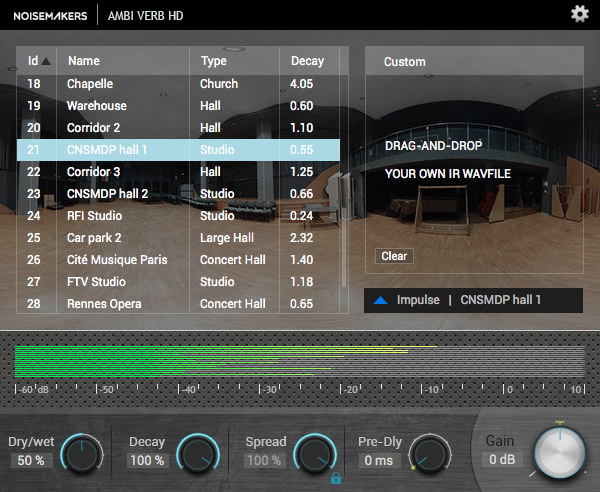 Ambi Verb HD contains 30 ambisonic room impulse responses, to simulate small and large halls, churches, music venues, stairs, bedrooms, exteriors, living rooms, cars, studios… Recorded with an AMBEO VR Mic, these impulses have been carefully selected and pre-processed for accurate and immersive listening. Custom room impulse responses can be loaded, in mono or ambiX (FOA) formats. 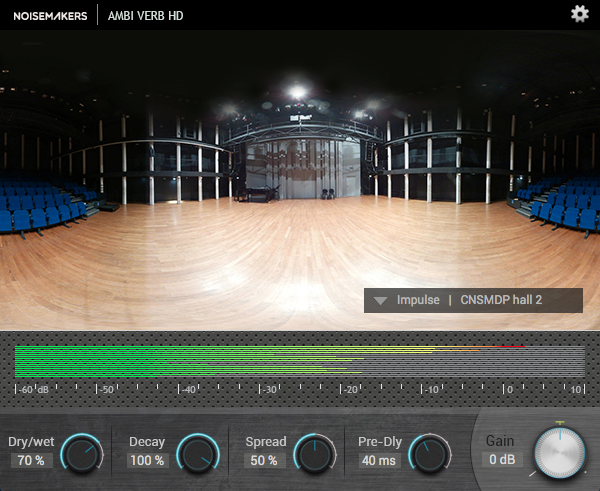 Ambi Verb HD supports ambisonic in/out up to third order (16 channels). It provides decay time control, and allows spatial spreading of room reflections. The plugin can be used as a direct insert in a track, or in an auxiliary bus. Distance can be accurately simulated thanks to the dry/wet balance. Dynamic switch between rooms is possible via MIDI program changes. Adding reverberation to 360 audio is crucial for source externalization and realism. 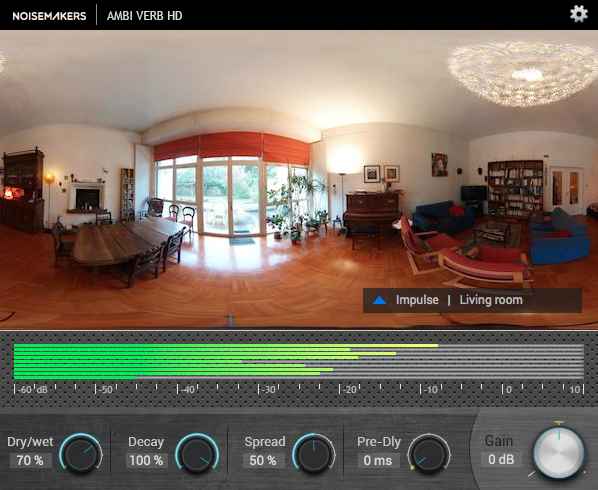 The aim of Ambi Verb HD is to create such immersive content easily, ready for 360 videos, games and VR applications. 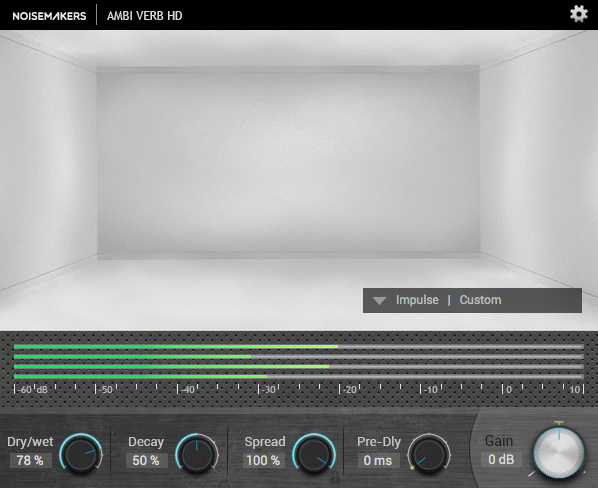 Ambi Verb HD is an ambiX convolution reverb, supporting high order ambisonics up to order 3. The input can be either monophonic (W channel only) or ambiX with 4 (order 1), 9 (order 2) or 16 audio channels (order 3). The output is an ambiX stream. To listen to this stream in your DAW, you need an additional Ambisonic decoder like Ambi Head HD, to hear the result in binaural. For more questions about Noise Makers ambisonic plugins, please contact us or visit Ambi Pan/Head FAQ.